This is a picture of Vince who is the older guy on the right. I have no clue who the guy on the left is. But you can see the sign behind them. That is the sign that I now own. 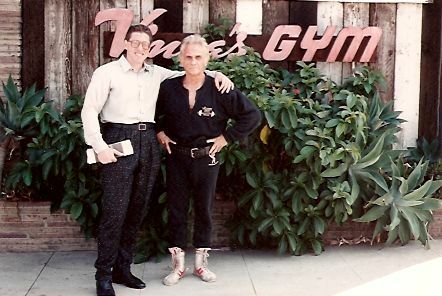 I am now the proud owner of the original Vince’s Gym Sign. I am very excited to have this piece of history. It means a great deal to me. 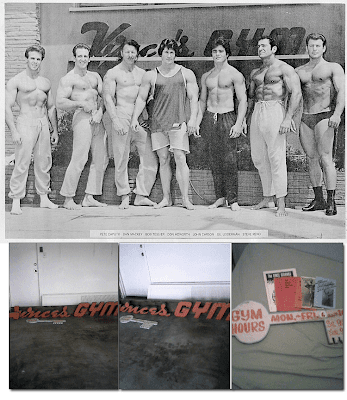 Vince’s Gym was the mecca for bodybuilders for over fifty years. And to now have the original sign that so many legendary bodybuilders and actors stood in front is just awesome. I know it was hard for the previous owner of the sign to part with, but he can rest assured that I will take great care of it. Personally, I believe that something of this historical value should be in a museum. If you want to see it come on down to The Fitness Nut House. It is very cool!! !